Artisanal ice cream has totally spoiled my tastebuds and now, Crème De La Crème (CDLC) has pushed the benchmark even higher. The café is hip and stylish, with an Instagrammable neon-lit unicorn on one wall, plain grey walls and black tables set off by white chairs and cement benches. At the front, glass chillers carry trays of sorbet, ice cream and mini ice cream cakes. At the far end, one can watch chefs at work through a glass window. Heading the kitchen team is Evelyn Choong who had trained under celebrity dessert chef Christy Tania of Australian MasterChef fame. Working closely with owner Lio Lim, she is the mastermind behind the creations. Heading the kitchen team is the petite Evelyn Choong who had worked and trained under celebrity dessert chef Christy Tania of Australian MasterChef fame. Working closely with Lio, Evelyn is the mastermind behind the many flavours and the cakes. CDLC offers sorbet in six flavours. Apart from fruity delights such as Raspberry and an amazing Mango Passion (made with creamy Alphonso mango), there are kopitiam-inspired sorbets. I love the Barley Lime (inspired by barli limau ais and made by boiling pearl barley and adding freshly squeezed lime juice) and Limau Assam (made with calamansi juice and assam boi) with a hint of saltiness from the salted plum to bring out the best side of the citrusy limau kasturi. DragonFruit Strawberry Sorbet is a fruity treat rich in fibre, antioxidants and Vitamin C from the red dragonfruit and strawberries. Meanwhile, the 12 flavours of ice cream beckon. One can even start the day with ice cream as Evelyn has crafted three breakfast-inspired ice cream: Cerealicious, Cookies & Cream and Pandan Kaya Toast. I’m not too keen on Cookies & Cream (made with house-baked cookies) and Cerealicious which reminds me too much of breakfast cereal but Pandan Kaya Toast reminds me of a childhood licking fragrant kaya off toasted Hainanese bread. To achieve this, Evelyn grinds dehydrated pandan leaves into powder which she bakes into a crumble with santan and eggs. This is swirled into ice cream to get that rich kaya aroma with an added crunch. Another worthy mention is French Earl Grey Boba. I love boba. This one has all the quintessential Britishness of Earl Grey milk tea with the right hint of bergamot. So, where are the boba pearls? Right inside the cone, so you can end with a satisfying chew after lick the ice cream. Definitely for boba lovers. There are many alluring names in the ice cream section, including Chunky Monkey (pureed fresh banana with salted butterscotch, walnuts and dark chocolate crumble), Black Forest (dark chocolate, Morello cherries and Madagascar vanilla), Yin & Yang (swirls of white and black sesame) and Musang King (with 100% pure MK durian). But what claims a place in my heart are Madagascar Ash and Miso Caramel. Madagascar Ash has to be the smoothest, creamiest ice cream to ever pass my lips. Lim assures me it’s guiltless too as it’s a low GI, sugar-free treat that even diabetics can indulge in. The secret’s in using maltitol, a sugar substitute, with Madagascar vanilla pods while bamboo charcoal is added for its detoxifying factor. The glistening deep silver hue is enchanting, mesmerising even. The Miso Caramel leaves me in tears of joy and sorrow. Joy over the “eureka” moment – this trumps all salty caramels. Sorrow as I can never settle for ordinary salted caramel again. Using miso is an inspired touch as it gives the caramel a salty edge with an umami kick. The second glass counter at CDLC makes me feel like a little kid in candyland. 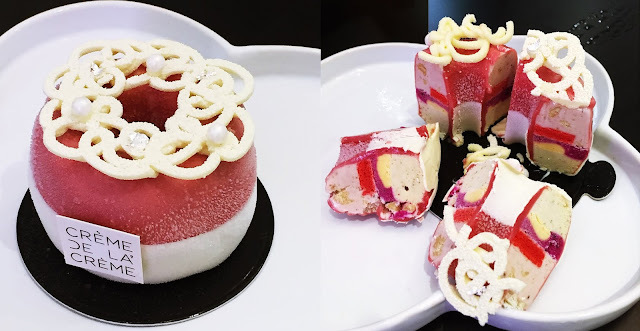 The seven mini ice cream cakes are works of art, handcrafted by Evelyn and her team. They look too pretty to demolish and I feel a little pang of guilt when I cut into one. For instance, Beauty & The Beast is a velvety rose in a glass bell with little dew drops to bring it to life. Rose “Beauty” is a combination of 63% dark chocolate and vanilla ice cream, mixed with Morello cherry sorbet to offer a bit of bitter, tangy and sweet. At the base, “Beast” is a layer of dark chocolate crumble, chewy chocolate brownie and almond nibs to provide a crunchy contrast in textures. Women will swoon over Lady Pearl, an elegant raspberry pink and white ring topped with a lace collar in white chocolate, with edible pearls and diamantes. Under the raspberry and white chocolate glaze is a mix of Strawberry and Madagascar Vanilla ice cream as well as Dragon Fruit Strawberry sorbet. Contrasting textures come in little crumbles and red almond sponge while passionfruit crémeux kicks in with a tartness to cut through the richness. How can one not love Bunny? Available only till Easter, this is a cute take with a coconut meringue rabbit on its back and feet showing instead of its eyes. This is a tropical burst of flavours with coconut, mango, calamansi, pineapple, lemongrass and passionfruit. The base is a crunchy chocolate hazelnut feuilletine base with almond sable. If you love chocolate, Da Bomb is da bomb! Imagine this: 63% dark chocolate ice cream and creamy Madagascar Vanilla in a soft, melt-in-your-mouth hazelnut ganache. For cakes in bigger sizes, the Celebration Cakes require pre-order of 1-3 days in advance and are priced from RM170-RM250. CDLC also offers coffee, tea and a drink with the intriguing name of Bloop! Bloop! Bloop! which turns out to be dragonfruit sorbet in lemonade and tinted with blue pea flower. Degustation of 4 mini cones: RM16.90.